WWF South Africa’s newly refurbished building in the suburban hub of Braamfontein has earned its ‘green’ stripes – achieving 6-star Green Star status. 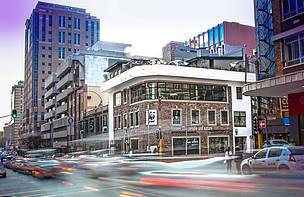 WWF South Africa’s newly refurbished building in the suburban hub of Braamfontein has earned its ‘green’ stripes – achieving 6-star Green Star status, the highest level of recognition from the Green Building Council of South Africa (GBCSA). It is also the first retrofitted building in the country to receive a 6-star rating. This exciting announcement was revealed today at WWF-SA’s 47th Annual General Meeting, suitably hosted at the 655m² site of WWF’s three-storey Johannesburg offices. The prestigious plaque acknowledging the building’s 6-star rating will soon be mounted at these premises. WWF-SA considers its refurbished building as a benchmark in sustainability and green building design. It showcases how innovative, practical and sustainable solutions – combined with creative design flare and lower cost production practices – can be adapted to influence the environmental impacts of a retrofitted structure. “We did not build our new office, we reconstructed it. We re-used and recycled everything that we could possibly salvage from this old structure. The WWF Braamfontein building ultimately disproves the notion that green buildings are expensive,” says Dr Morné du Plessis, CEO for WWF-SA. To gain this level of Green Star rating, several systems and strategies were employed which resulted in an impressive environmentally innovative and intelligent structure. Administered by the GBCSA, the Green Star SA certification process requires that specific undertakings are adhered to and implementations are assessed based on a rigorous points system. Various documents must be submitted to the GBCSA to provide evidence to support the desired rating and independent assessors then evaluate submissions and allocate points based on the green measures implemented. Certification is awarded for 4-, 5- or 6-star Green Star SA ratings. Ideally located in a diverse corner of South Africa’s main business city, and contributing to Johannesburg’s rejuvenation initiative, WWF’s Braamfontein building boasts many features focused on the core principles of sustainability. These include the re-use of 80% the original building materials in the re-design as well as natural ventilation, a closed water recycling system, light-sensitive blinds, various insulation solutions and an indigenous rooftop garden with water-efficient plants that are watered by rainwater. Richard Duckitt, from Bornman Associates, was the green building consultant and project manager on the development. Construction started in 2012, with the building handed over to WWF at the end of January this year and the application for the 6-star rating process began soon after. Today, this newly renovated platform has become a base from which WWF-SA is able to engage with key stakeholders and conduct its work across South Africa. It also serves as an open invitation to anyone in the area to connect with WWF. With its luxury boardroom and audio-visual room, both featuring state-of-the-art conferencing facilities, it is the perfect venue for companies, groups or non-profit organisations that need meeting facilities or who wish to connect with colleagues or clients abroad. And by using such technologies, the collective business carbon footprint can be reduced. “WWF is ultimately all about heritage. Whether it is natural, social, environmental or suburban heritage, WWF cares about conserving those things that are most valuable to South Africans. Our work is not just about conservation or the environment. It is about inspiring people to make the right choices when thinking about living sustainably, and taking care of our planet,” concludes du Plessis. Energy: No artificial cooling capacity exists in the building, with both natural ventilation and forced mechanical ventilation used, as well as sufficient natural light pouring in to reduce energy consumption. The interior is also not covered with tiles, paint or plastering in order to thermally activate the building and allow it to ‘breathe’. Water: To reduce the building’s water footprint, features were introduced to curb the reliance on both municipal water and electricity. Water use is reduced through on-site treatment of effluent and this treated water is then re-used in the building. Waste: By using waste recycling storage areas – with bins available for paper, glass, plastics and general waste on each floor – recycling is strongly encouraged so as to reduce the waste going to landfill. Transport: As transport is a big contributor to greenhouse gasses, the location was strategically chosen to be close to public transport such as the Gautrain Park Station. Staff are also encouraged to carpool and use WWF’s low-emission pool cars to get around. The WWF office in Braamfontein is a benchmark in sustainability and green building design.